For many years, celluloid has been the choice of guitarists worldwide. Most have used them in a dark tortoise shell color with a popular guitar manufacturer’s logo on it. Our goal was to make a celluloid pick which would offer the PURIST guitarist just enough gripping power as they need at any time during a performance. Not too much, but just enough without getting in the way. 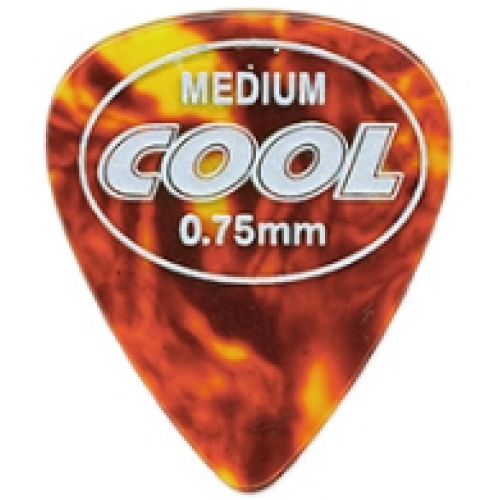 We at cool music know that no two guitarists are alike and that is why the revolutionary PURE-CELL MICRON Accu-Grip pick was created. It is truly a smart guitar pick. This pick design actually will change its gripping texture to give the dry, wet, or even slimy fingered guitarist the proper grip at all times. No matter how bad your flop-sweat or nerves on that special gig may be, you will not lose your pick while playing those super fast cool lead lines. If you are now playing another celluloid pick, you owe it to yourself to… “TRY THIS PICK”!!! It is important for you to realize that this pick will actually change its feel dynamically as you need it! While you play! That is, if you start playing dry and end your song or set with moist fingers the pick will get grippier as you need it. Now that’s cool! It IS ONLY 2 MICRONS THICK!! Our thinnest grip yet! The CELLULOID material used in our production is guaranteed free of defects and will not break or crack under normal or even strenuous playing conditions.